As they’ve already proved with a big defeat to Holland, and narrow escapes against both Romania (Buffon’s late penalty save) and France (got to play majority of game against ten men), the 2008 Italy is nothing to be feared. Spain should beat them in the quarter final, what with the Spanish having much better players and all. But we know what will happen instead – the Italians will fluke a first-half goal (probably from a set piece) and then activate reverse gear, and sit on their lead for the rest of the match. I wasn’t that unhappy when Italy won the 2006 World Cup. After all, they knocked out the Germans with penalties looming – and who doesn’t love to see the Germans knocked out of a World Cup? Okay, they weren’t the best team in the tournament (Argentina were), but you had to at least admire their defence and team spirit, not to mention their ability to squeeze out a result when it really mattered. Up front, they were pretty useless, as always – their top scorers in Germany were Luca Toni and Marco Materazzi (says it all), with two goals each. And never mind that they only had to beat Australia and Ukraine to get to the semi finals, followed by a past-it France in the final – although I concede that they did well to win their Group of Death. So, I could just about bear that triumph. But please God, don’t let them win Euro 2008 as well. Because it could happen. Italy are the last opponents Spain would have wanted in the quarters – the Spanish inferiority complex will really kick in then. Two years on, and Italy are not as good. The only player from the 2006 vintage still performing at a high level is Gigi Buffon, who remains the best goalkeeper in the world. Apart from him, the team looks nothing special – Luca Toni couldn’t score at a barn-door convention right now. But I thought that in 2006, and look what happened. The Italians are always greater than the sum of their parts, and I suppose I should admire that. I can do without the amateur dramatics (the endless dives, the audible squeals when tackled, Cassano whipping up the crowd during the match, Gattuso kissing his badge whilst being subbed off etc.) though. 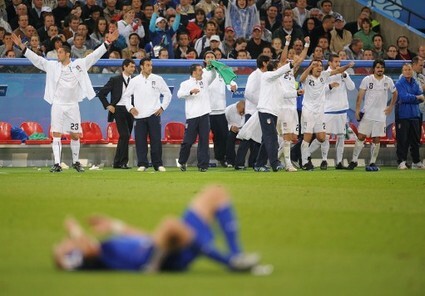 And, ultimately, I could really do without Italy winning Euro 2008.